– HOW CAN I ORDER WOODEN ACCESSORIES BY HOLZSPECHT? You can place your chosen wooden product into your shopping cart by clicking directly on the shopping cart symbol or by going to the product site and clicking on “place in shopping cart”. In order to continue your order please click on “checkout”. Then please enter your details for the invoice and choose your preferred payment method. After that you finalize your order liable to pay by clicking on “order liable to pay”. – WHICH PAYMENT OPTIONS ARE AVAILABLE? Holzspecht offers several payment options. You can choose to either pay by means of Sofort payment, credit card (through our payment provider Stripe) or Paypal. – WHERE DOES HOLZSPECHT SHIP TO? Holzspecht delivers wooden accessories free of charge within all EU member states. Shipping and sale to non-EU countries is currently not available. For further information please visit our shipping site. – WHAT ABOUT SHIPPING COST? Wooden products by Holzspecht are shipped free of charge from 80 Euro order value within the set delivery area. – HOW CAN I CLEAN MY WOODEN WATCH BY HOLZSPECHT? For cleaning your wooden watch please use a soft cloth. Avoid usage of soap or chemicals, as that might damage your wooden watch. – WHERE ARE THE WOODEN ACCESSORIES BY HOLZSPECHT MADE? 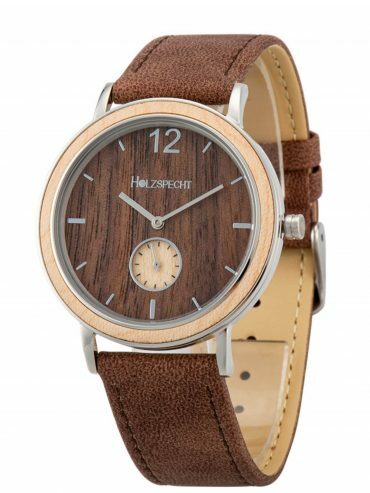 The wooden accessories by Holzspecht are designed in Austria, they are being produced in China, the watches’ movement is a Swiss precision movement. Our office is located in rural Styria, Austria. – MY WOODEN PRODUCT IS NOT IDENTICAL TO THE WOODEN ACCESSORY DEPICTED IN THE WEBSHOP. WHY IS THAT? All of our wooden products are made out of the natural material wood, therefore the used wooden pieces are not identical as they originate from different trees. That is why, in comparison to the product image, slight variances in colour and wood grain might occur. – WHAT DO I DO WHEN THE BATTERY RUNS OUT OF ENERGY? We use long lasting batteries. But still, at some point every battery will run out of energy. In case that happens, please contact a local specialized shop of your choice and have the battery exchanged. Information on the battery type is provided in the instructions for use, supplied with your wooden watch in your Holzspecht packing box. 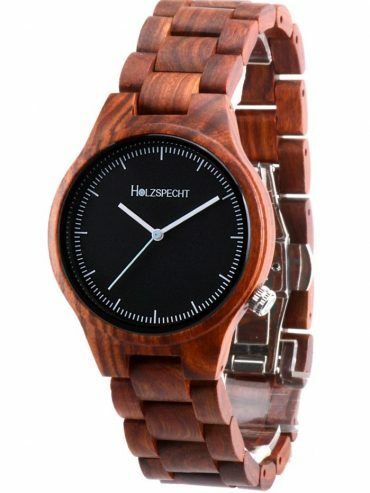 – IS MY WOODEN WATCH BY HOLZSPECHT WATERPROOF? 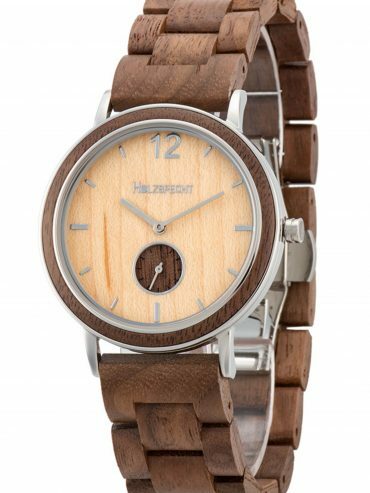 The Wooden watches Dachstein, Waldgoldstern and Wildensteiner by Holzspecht are splash water proof. The metal-wood watches Karwendel and Feuerkogel meet 3 ATM. But please notice that details on water resistance mainly concern the casing and clockwork. However in general wood is a natural material, that doesn’t tolerate water well. Therefore, please avoid contact with liquids. This also goes for the movement of Dachstein, Waldgoldstern and Wildensteiner. In general please take off your wooden watch before washing your hands, showering or going swimming. – HOW CAN I ADJUST THE WRISTBAND LENGTH OF MY WOODEN WATCH? You can adjust the wristband to your wrist size. For information on how to do that with the supplied tools please visit wristband adjustment. As well as in the instructions for use supplied in your Holzspecht wooden box. -WHAT TERMS APPLY REGARDING WARRANTY? We are convinced of our product’s high quality. Therefore we offer warranty for two years after the date of purchase, if the wooden accessory by Holzspecht was used in accordance with our instructions for use. Warranty claims are only applicable upon presentation of the valid invoice, respectively payment receipt. Warranty includes potential manufacturing- or material faults present at the date of purchase. We will provide the same or a similar model of the wooden product if, in case of applicable warranty, repairing your wooden accessory is not possible. Damage resulting from regular usage, wearing and tearing, heat- and water damage as well as the watches’ battery, theft or loss are excluded from warranty. In case of a warranty claim please contact us for further handling of your claim. – YOU HAVE A SHOP AND WOULD LIKE TO INCLUDE HOLZSPECHT’S WOODEN ACCESSORIES IN YOUR PRODUCT RANGE? We thank you for your interest and your inquiry! Please contact us through [email protected] for discussing further details!